The tag line for the poster of this movie reads "The Most Terrifying Film You Will Ever Experience." Talk about false advertising. Evil Dead (remake of the original The Evil Dead (1981)) is probably not even as terrifying as a episode of Scooby Doo. Which begs the question: why is it so important for horror films to be remade. I just don't get it. Is it to make money? C'mon, that shouldn't be the reason. Is it so a new generation of fans can experience a second rate version of a beloved classic? Hope not. Here's an idea, how about watching the darn original. Really, enough is enough. So far there have been remakes of The Fog (2005) (absolutely dreadful), The Amityville Horror (2005) (a Ryan Reynolds movie so I don't need to say anymore), Halloween (2007) (watchable but Rob Zombie is no John Carpenter), and Nightmare On Elm St. (2010) (far and away one of the worst remakes of all time in any film genre). There is one exception though. The remake of The Texas Chainsaw Massacre (1974) which came out in 2003, was pretty solid. But we all know what happened after that, Texas Chainsaw The Beginning (2006) and Texas Chainsaw 3D (2010). Lord help us. Anyway, sticking somewhat close to the plot of the original, Evil Dead tells the tale of 5 friends (one of which looks like a cross between 90's rocker Kurt Cobain and 70's folk singer Sammy Johns) who while staying at a log cabin (literally in the middle of nowhere), are tormented and tortured by evil forces beyond their control. You see, they entered the basement and found a book entitled, "The Book of the Dead." This book is bad news because reading it brings back, or propels demons to enter from the nearby woods. You get the point. What makes this Evil Dead a lousy and tired exercise is simple: there is a lot of blood and gore but it's just not that scary. When a film is scary to me, it haunts me for days. I have trouble sleeping. I think about it long after the credits roll. The only thing rolling when I left the theater was my eyes. The acting, though not necessarily Oscar worthy in most horror movies is monumentally bad in this one. The lead actor and I guess hero (Shiloh Fernandez playing the character David), looks like a cross between Vincent Gallo and Joaquin Phoenix. That's about it. His acting range is about as wooden as the log cabin that is shown in the first five minutes. The other members of the cast try hard with the stale script. But in the end they give off the vibe that they're just happy to be in a film in general. The biggest omission with these characters is being in any peril or actual real danger. When they're being tortured by the demons, you can barely hear them scream. It's almost faint I tell you. And the scares (or lack there of) which are typical of good horror films, have that "seen it before" feel in this one. If you want a truly terrifying movie that takes place in a log cabin, go with Cabin Fever (2002). 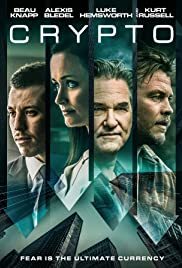 It's underrated, not seen by hardly anyone, and its premise and execution of that premise, will chill you to the bone. Let's face it, most moviegoers after seeing this mess will probably prefer the original The Evil Dead (1981). I'm one of them. It had a grainy old school look to it which I liked. It wasn't the most terrifying movie I ever saw but I do give it points for being comedic and over the top. This remake however is not comedic and it is over the top but not in a good way. I will give it credit though for actually trying to break new ground. It adds a subplot about David's sister (Jane Levy) harboring to get over her drug addiction therefore throwing out a different reason for the five characters to venture to the woods. And the special effects, they garner it at least one extra star from me. They aren't too shabby. But again, you need more than just your typical gross out horror tactics to make a good film. Honestly, i'd have to say that Evil Dead suffers mostly from just being flat out stylish. 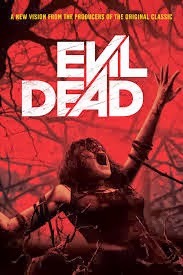 All and all it's maddening that the guys from the first Evil Dead (Bruce Campbell (star) and Sam Raimi (director)) actually wanted to produce a reboot of the movie that made them a household name. Guys I never thought I'd say this but this stinker of a film is "dead" on arrival.